Our management team understands the dynamics of new construction work. There is a wide selection of roofing options available on the market, each with distinct features and price points. When you’re getting a new roof built, there are some vital factors to be considered before selecting the new roofing material. Replacing vs. Repairing If you are considering roofing options for an existing building, you might want to weigh the pros and cons of each of your selections to decide properly. You have the choice of repairing the existing roof, constructing a new one, or having it reconditioned. The cost of the project will vary depending on the extent of repair and replacement. Deck Integrity It is important to get the structural strength and durability of the roof decking inspected by a professional roofer. If the roof deck is damaged, it might not hold up the new roofing. Temperature It is essential to factor in the climate of the area you live in. In a hot climate where the temperatures rise, you should opt for a roof that can withstand excessive heat and protect against the harmful ultraviolet rays. On the other hand, if you live in a place that gets quite cold, you might want to consider roofing material that can remain unaffected by the drop in temperature. Drainage With a flat roofing system, you must consider the drainage system for rain, snow, and other precipitation, and ensure that waterproofing materials are used to avoid any leakage. R-Value The higher the R-value, the better it is for you in terms of lowering your energy bills. Although the investment required for a high R-value roof is relatively higher in comparison to a lower R-value roof, it will pay off in the long run by saving you money on your energy bills over time. Wind ResistanceStrong gusts of wind can cause damage to your roof, so it is vital to choose a roofing material that is wind resistant and can withstand the wind speeds in your area. EPDM Ethylene Propylene Diene Monomer, referred to as EPDM, is a strong, flexible material that is best suited for harsh climates. TPO Although similar to EPDM, thermoplastic olefin, or TPO, does not have as long of a lifespan in comparison. Modified Bitumen Also known as mod-bit, it is made up of two plies of reinforced asphalt bitumen that has been modified. The modifications come in the form of atactic polypropylene, or APP, which is a plastic copolymer, and styrene-butadiene-styrene, or SBS, which is a rubber copolymer. Each variant gives the bitumen elasticity and flexibility. Colder climates do well with SBS mod-bit. 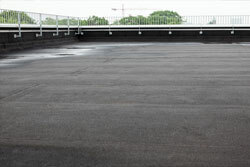 BUR Built-up roof, known as BUR, generally consists of four plies that are laminated together with liquid hot asphalt bitumen and then surfaced with ballast. The plies are often made with different types of felt for strength, the asphalt provides waterproofing, and the ballast protects the roof from foot traffic and UV rays. At Can-Sky Roofing and Sheet Metal, we believe in quality craftsmanship and outstanding customer service. Partner with design leads including engineers, architects, and consultants to ensure that system selection and specifications meet the necessary performance requirements and other criteria of their design. Co-ordinate with the General Contractor (GC) to deliver a build that seamlessly integrates into the project from pre-construction until building commission and completion. Our production crews are experienced in working with other trades and understand their role and work’s impact on the final new roof construction. Our team understands the elevated health and safety risks associated with general construction worksites.